Bikes on Buses - Ardent Solutions, Inc.
Access Allegany buses are equipped with bike racks on the front of them for your convenience. Simply ride your bike to a scheduled stop or a spot along a route and arrange for a flag stop, and when the bus arrives load your bike on the front. 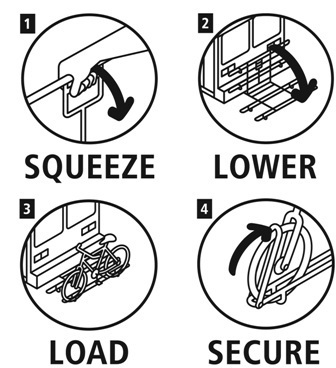 Loading Your Bike is Easy! Squeeze the handle in the center of the bike rack. Load your bike onto the rack. Secure the bike by placing the arm over the front tire of the bike. Remember, if it's your first time loading your bike let the bus operator know and they can show you how to properly load your bike.